Tri coaching for all distances & all athletes. Beginner to advanced, your goals will be addressed. Professional, courteous & dedicated to the needs of the athlete. Local or international, in person or online. Every athlete is different and programs are designed to fit your needs, goals & abilities. Fees determined accordingly. For the past 14 years, I have competed in triathlon at every distance & have been fortunate enough to represent Team USA in Beijing China. I've coached athletes for 13 years on all levels from sprints to IM, from finishing to podium. I have watched athletes endure on all levels. My coaching is designed for the individual, based on the athlete’s needs & abilities. My coaching ranges from simple heart rate, to the more in depth, gait analysis, swim analysis, bike power interpretation for maximum performance, Performance Management Charts (PMC) to monitor your progress, Functional Threshold Power (FTP), & Functional Threshold Heart Rate profiles to help you nail your numbers on race day. From Sprint to IM, I find if you “tri” you will succeed. The races are only part of the success - there is the training along the way, meeting people who are helpful, finding your limits & surpassing them, doing things you never thought you would do. The triathlon community is world wide - I have clients from the US, Canada, Egypt, and Abu Dhabi. Holding the following certifications - Level 1 USAT Coach, Cat 2 Elite Official, USMS Swim Coach, TP Level 2 Certified Coach, NASM Certified Personal trainer, Corrective Exercise Specialist, Fitness Nutrition Specialist - helping clients with Movement Impairment Syndrome - helps me design plans with specificity for each athlete, giving them results that far outweigh their expectations. From techno geek to techno challenged, I’ve got you covered. Success. Coach Vicki Edwards has been notified of your message. 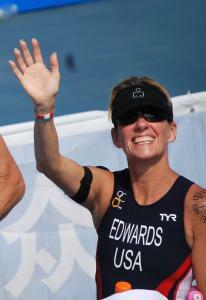 To hire Vicki Edwards as your coach, select the coaching service that is right for you.